Outfit: Banana Republic blazer £10 (BR outlet store), Alexander Wang t-shirt £35 (sale), Uniqlo jeans (£30) and Repetto leopard print ballet flats £86 (sale). Outfit: Trench coat £20 (from a no-brand store in Hong Kong), Karen Walker blouse £40 (sale), Uniqlo jeans £30 and Repetto flats £55 (eBay). A lovely reader wrote to me asking if I could come up with cheaper alternatives to jackets.This got me thinking. 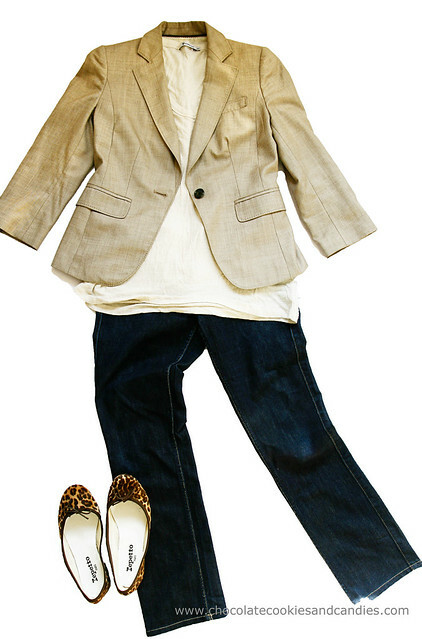 Can we still dress well without forking out a lot of money? Why, yes! Easily. Thanks to the Industrial Revolution, goods can be mass produced cheaply and are readily available to the general public. 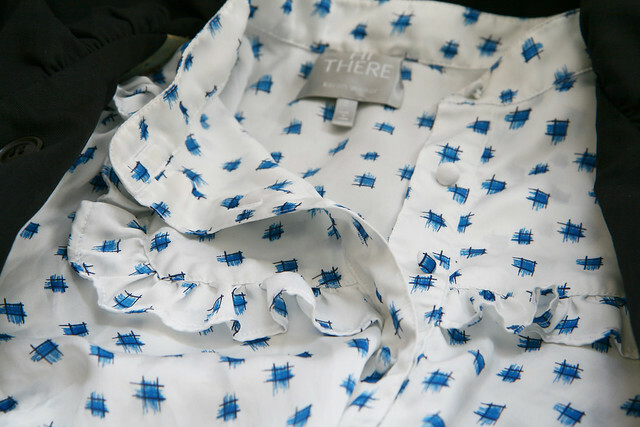 I dug into my meagre cupboard with gusto and managed to pull out a large number of pieces which were purchased for well under £100 (with the exception of the Hermes scarf). And those pieces are awesome M! Anyone can do it. A lot of popular stores now have outlets and if you subscribe to their mailing list or email list they will definitely let you know what's available and give a deeper discount on already low prices. I know that's a HUGE run on sentence, but WHATEVER. hahahaha Love what you put together. I think the US is a shopper paradise. You guys get the most incredible discounts. YES!!!! My entire philosophy in life is spending less for clothes (which I tire of easily anyway). Anyone can put together an expensive outfit but it takes real talent, patience, and creativity to come up with these gorgeous combinations! You're a sweetheart, S! Why pay more if we don't have to? BTW, has it been more than 7 years since I first clapped my eyes on your VCA turquoise earrings?? Love your new profile photo! Wow - those are some fantastic deals. Of course, the looks are super fun, chic and classy! WOOHOO! You, my friend along with S have a knack for putting clothes together. Great outfits at great prices. Spending more doesn't guarantee an incremental rise in chic, sometimes I think I looked as good when I just had a 2shirts, 1 skirt , 1 jeans and 1 sweater ...ie student days . I agree, Estrella. Sometimes I think when we have too many clothes, it's a headache trying to decide from the sheer number of choices not to mention problems with storage. Keeping it simple helps. I remember the student days. Life was so uncomplicated then. hahahaha....You're too funny! I've been pretty lucky with my purchases but I've been known to stalk or trawl something for years until I've found it. Kat, actually I've found them to be cheaper at Neiman Marcus during sales. However, I managed to get mine at ridiculously low prices (think £40) on eBay and Yoox. The leopard print flats were a lucky find at Yoox for £86. Hi Marlene, I can't believe you can find some of these things on sale! Those Repetto flats and the Converse sneakers. Ever since you talked me into my Repetto's I have been converted. I wear them 5 days a week! I'm so glad you like them. You definitely can't go wrong with a pair of black Repetto flats. Will have to take you to their store in Paris. Love the one at Place Vendome. 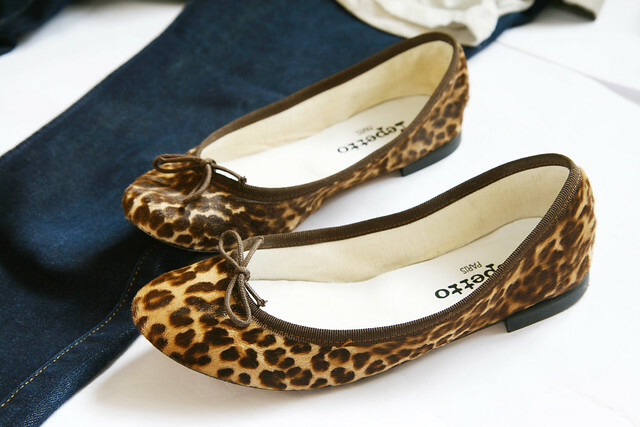 i love the leopard flats! and that blazer is such a great steal. This is a fantastic post! Thank you for the sale and resale inspiration. I can't believe this marvelous collection of Repettos didn't cost a fortune! Hmmm, I need to call upon you when needing some shopping advice. I've only ever paid retail for 1 pair of Repetto flats. The rest were all purchases on eBay, Yoox, Asos or sales. 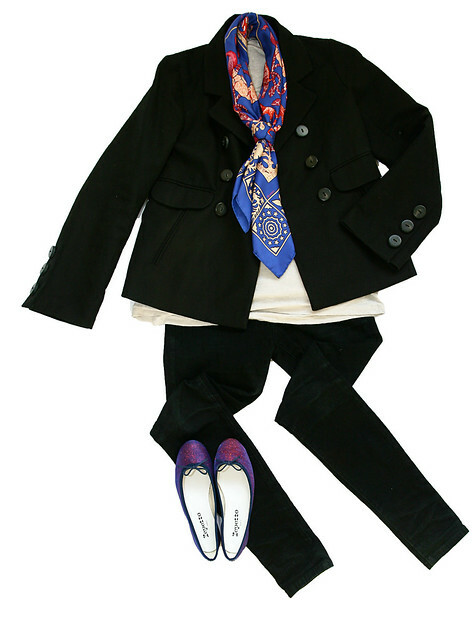 Lovely post, I just adore the pea coat, it is such classic and I could wear it all the time! I'm definitely a big fan of not spending a fortune in clothes, thus my love for Uniqlo and other affordable brands. All you need is a bit of research to find the perfect items in a nice price. I prefer spending in accessories, jewelry bags and shoes, that don't have sizes lol! This way I can wear those for ever and not feel guilty about them. Like you, I tend to balk at forking out ££££ for clothes but it's the no the same for shoes, bags and accessories. J'adore Uniqlo!! Hi Shan Ty! You gave me a great idea. Thank YOU. I hope you had a great time in Italy. Do share about your trip. I have no idea that repettos are so cheap over at your side of the world. A pair easily cost around SGD400 at my end of the world, and they hardly go on sale. Cecilia, Repettos aren't cheap here either. I've just managed to nab them on eBay for ridiculously low prices. All brand spanking new. Love this post. HK is great for finding no-brand/cut price bargains, but you do have to have patience and luck. Love your trench! And the H scarves on a cost-per-wear basis must be pennies! I-Ping, that's what I keep telling myself about the H scarves! LOL. The trench coat was a lucky find because I happened to wait outside TST area for my mother. Otherwise, whenever I'm in HK, it's all about the food. Not good for the waistline but it's hard to resist the temptation. Meg, it took me ages to find a pair in my size. Hope you have better luck than me. I love deal hunting, and you found some great ones! My biggest luck was when I bought a 400$ Ralph Lauren dress for 7$. It was not my size, not even close, but oh what a find! Regarding your outfits I especially love the first and second look and I want to have some repetto flats in my life, they look very comfortable. $7 for a RL dress?! That's an incredible deal. I've been wearing Repetto flats for 6 years now and a true convert at that. Super comfortable but check the sizes. They tend to run small. I really like the casual chic vibe of these outfits. While I prefer to buy better products on sale which you seem to be the master at, I have found that it is possible to get great looking classic pieces at H&M and Forever 21. The key though is to have an eye for those items which don't look cheap. I just got an awesome medallion printed unconstructed blazer from Forever 21 for $24 the other week which I've worn 3 times already. I haven't had much luck at H&M or F21. I guess I'm just so overwhelmed by the sheer size of their shops. No secret at all ;o) It was a 2nd or 3rd markdown at a sale. M, you took the words right out of my mouth. HAHAHA At first I thought the model was trying to camouflage her (BUT she didn't help her). Thank God for the other two! I'm so glad we're bloggie buddies ((HUG)). We're learning together. :) Hope you're having a great day my friend. Thank you! Speaking of which, I should really start wearing my pea coat a little more now that the weather is warmer. I agree! We have incredible bespoke shops here. I guess we can't have it all. Ever since I started reading your blog, you've got me obsessed with Repettp. However, since I live in Malaysia, the prices here and in Singapore as well as Hong Kong are just ridiculous. Would you like to offer your services as a personal shopper? Would love to get a pair! Hi Farainie, thank you for taking the time to write. I used to be able to get a pair of Repetto flats from On Pedder for SGD 200 5-6 years ago but no more. LOL. I'm a personal shopper to the rest of my family in NZ and Australia. Actually, Yoox ships internationally. In the past, I've managed to get a few France and UK based sellers to ship them to me in NZ. I'd suggest trying ebay.co.uk and eBay.fr to search for your size. I love all of these outfits. I really believe that when you have style (which you do) you can find wonderful, well made things anywhere. You have a great eye and I love everything here. Those glittery repettos are divine. This is a wonderful compliment coming from a blogger whose style I admire immensely. CdC often have amazing sales as long as you're happy to wait for the 2nd or 3rd cuts. How did you manage to get the Comptoir des Cotonniers peacoat at such a great price? Mona, there used to be a twice yearly Burberry sample sale in London. I never truly bothered as the crush of people scared me. This was probably my best amongst the few purchases I'd made at the sale. Comptoir des Cotonniers had a 50%-75% sale a couple of years back. I picked up a few tidbits here and there. I think the original price for the peacoat was £125 or thereabouts. Wow !! Love every and each outfit !! Totally my style !! Love the repetto leopard print pumps and the Burberry quilted jacket. And yes..I have to echo this like the rest...you truly put together the combos well. 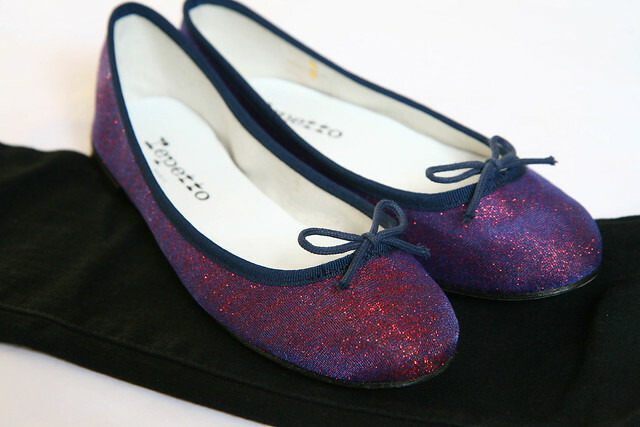 Your Repetto shoes are lovely !